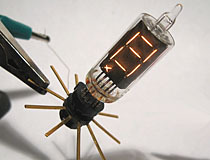 Filament displays were a niche alternative to the neon Nixie tubes that were the numeric display of choice during the 1960s. 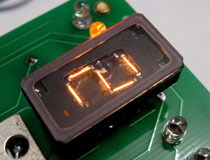 Sometimes sold under the brand name of Numitron, a filament display uses thin low voltage wires sealed in a vacuum to generate a lighted digit, similar to the way a lightbulb works. 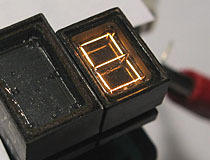 Unlike Nixie tubes, filament displays use a very low voltage, normally five volts or less, which makes them ideal for interfacing with modern TTL chips. 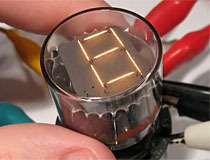 The tube-shaped Numitron later evolved into smaller DIP-style Minitron and Pinlite displays, still used in some applications due to their high visibility and extremely low failure rate. Tubes like the DA2010 shown to the left are the definitive examples of filament tube construction. 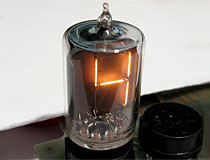 The tube uses a seven segment digit with a set of crossed filaments to represent a decimal point and possesses a standard nine pin miniature tube base. Note the flat envelope top, a feature distinctive to many IEE filament display tubes. This tube was manufactured in a myriad different types by many companies, some with different style envelopes or different characters and decimal point configurations. 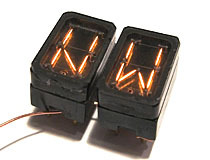 The DA-2110, manufactured by IEE, is a subminiature version of the larger and more common DA-2010 filament display. This tube contains a small seven segment filament display with decimal point and has a nine pin flying lead base. 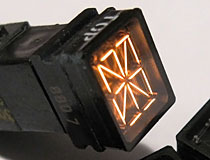 As with the DA2010, the DA2110 has holes in its plate for a plus symbol that are unused in this model of tube. RCA also made a variant of this display, the DR2110. 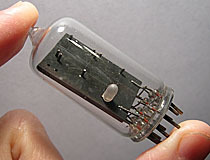 The RCA version is almost identical to the IEE tube, with the exception of a slightly thicker support wafer for the filaments. A minitron is an advancement of filament display technology that follows the same evolutionary step as a panaplex neon display. Instead of being sealed into a tube, minitrons are constructed into rectangular DIP-style envelopes that can be easily integrated into modern circuit layouts. The 3015-F is a fairly standard example of such a device: it has a glass front bonded to a sheet metal case, which is covered with a removable plastic cover. This model of minitron was manufactured in at least two different styles, one of which has a black matte around the display area. Digit height on the 3015F is 10mm and the package is 23mm long from end to end. When operated at 5VDC, the 3015F is rated for 50,000 hours of continuous operation. The Wamco KW-105 is a nearly modern implementation of minitron display technology, and is also incredibly compact. This display is truly minuscule, the digit height being only 8mm. The display's tiny package leaves no room for a decimal point indicator, and decimal points were provided by a separate thin minitron display inserted into the display stack. Fortunately the display's 8 pin base uses standard pin spacing, allowing sockets to be easily made from SIP pin header strips. Wamco still manufactures these displays for use by the highly conservative military avionics industry. For many years collectors believed the KW105 and it's variants to be the smallest minitrons produced, though it is now known that several obscure displays were produced with digit heights below 8mm. These smaller displays almost always have weird voltage requirements or complex hard-to-find sockets however, making the KW-105 arguably the smallest practical choice for the electronics builder. The Pinlite 430 is one of a handful of ultra-miniature minitron displays produced for applications where the benchmark KW-105 was simply too large. These obscure displays are actually about 30% smaller than the KW-105 and MD-650 displays typically used for miniature applications; digit height is 6mm and the entire display is 9.5mm high. The 430 is equipped with shorter filaments than it's larger brothers and operates at only 4 volts, typical circuits include a diode in series with each segment for 5 volt TTL compatibility. Additional design complexities are introduced by the unusual tubular base used by this display, which requires use of an specialized socket. Perplexingly, the standard socket for this device actually has a larger footprint than the display itself, negating all of the size advantage of the display's smaller dimensions. 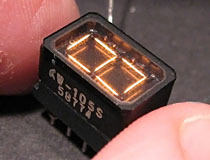 Allegedly a socket with integrated diodes for TTL compatibility was also produced, but the supply of such in the surplus market is as thin as ether. The modern builder would likely have to solder flying leads to the base of the display if they intended to use one in a project. The RCA DTF104B is one of only a handful of end-view numitrons available, and is also one of the largest. This tube uses a large 'novar' style nine pin base, a fairly common socket when compared to some exotic display tubes. The tube does not have a decimal point, though vacant holes in the ceramic indicate that a decimal point may be present on some models. It is noteworthy that even though the DTF104B is a fairly hard-to-find display, a single vendor on Ebay sold vast bulk quantities of the tubes over a ten year period, keeping the price low and filling the parts bins of innumerable home builders. For this reason, the DTF104 sees much more use in home projects than expected, given their paucity on the open market. 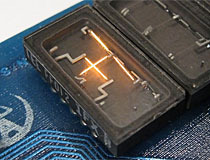 The FFD21, a 'minitron'-style display made by IEE, comes in a 15 pin package, which contains a single seven segment display and a separate filament to represent the decimal point. This display has a much larger display area than the 3015F: with a digit height is 17mm and a package length of 28mm, it is one of the largest 'minitron'-style filament displays ever made commercially available. The small pin in the bottom center of the display is a hollow metal tube that would have been used during construction to pump the air out of the enclosure. The FFD21 is rated for 100,000 hours of service at 5VDC and normal drive currents, twice as long as the more common 3015F minitron display. IEE also made a high brightness version of the FFD21; the FFD51. The FFD51 is more than twice as bright on a per segment basis, and outputs 13,000 fL compared to the FFD21's 4,500fL. The display's lifespan is significantly reduced as a result however; the FFD51 is only rated to operate for 40,000 hours. The IEE Aurora FFD61 and FFD81 devices are large, attractive minitron displays packaged in a bathtub-style metal hermetic shell. These displays have the same 17mm digit height and 21 pin basing pattern as IEE's large ceramic displays like the FFD21. Despite being advertised as a ruggedized version of the FFD21, these metal-clad displays are actually more susceptible to damage... striking the side or edge of the display tends to deform the metal and break the metal-on-glass seal. The FFD81 is rated for 100,000 hours of service at 5 volts, though on a display this large the filaments will start to 'sag' from the pull of gravity after only about half that time. The modern builder should consider building projects that allow the displays to be rotated 180 degrees periodically, which can increase the useful lifespan of these devices by several years. Interestingly, the FFD61 is not included in the standard Aurora databook, but we suspect this device is a lower brightness version of the FFD81. The IEE Aurora handbook contains no mention of any filament displays with patterns other than a traditional seven segment, but the FFD12 is just such a device. The FFD12 contains only four filaments, arranged in the traditional 'plus one' configuration used to display polarity and overflow conditions. Though plus one displays are common amongst other display technologies for use in calculators and digital meters, minitrons with such a pattern are very rarely seen and this is one of the only examples of such a device that we know of. The FFD12 has a package height of 22mm, making it approximately 25% smaller than IEE's flagship FFD21 Aurora display, which is shown above. Wamco is a prolific manufacturer of 'minitron'-style filament displays, and produced a number of specialized displays for the aerospace industry. These devices are a good example, a pair of special symbol displays which were originally intended for use in navigation systems. The KW-104EW can display either an "E" or a "W" character, and the KW-104NS can display a "N" or "S" character. Despite appearances, these tubes are not segmented, they can only display the two special characters for which each is designed. Strangely, these tubes actually have doubled filaments in any segment position where the characters overlap, even though it would have been cheaper and less complex to simply share segments in the same way as a normal seven-segment display. Though these devices have a flat package and 8 pin bases, they are not DIP compatible; the pins are arranged in an unusual star-shaped pattern that is incompatible with modern breadboards. Nothing epitomizes the conservative nature of the aerospace electronics industry more than this hilariously over-engineered decimal point display. 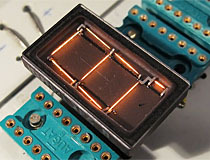 Whereas a sane person looking for a decimal point to pair with a filament readout would simply use one of the many available incandescent bulbs on the market, Wamco decided that the only proper way to tackle this problem was to build an entire minitron display just to contain a single decimal point filament. 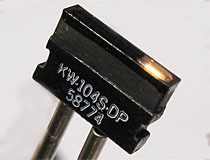 THe KW104S-DP is made from the same ceramic and glass bathtub as Wamco's other minitron displays, and contains a short stub filament suspended from two pins. The rest of the display face is painted black, which hides the large empty void that makes up the majority of the display's interior. The KW104S-DP is the same height as a KW104 or KW105 display, which makes for easy tiling of multiple display elements into a single module. Wamco made minitron-type displays in a wide variety of styles. These tiny KW-105AL filament displays are 16 segment devices, and can display a full alphanumeric character set. Though they are wider than the KW-105S pictured above, digit height is the same at only 8mm. The KW-105AL has a very unusual base, which consists of 17 tiny tubular sockets arranged in a "C" shape. The special socket designed to work with this display has pins which mate with the tubular sockets on the base of the display. 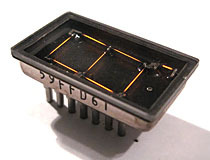 The Lamps, Inc. 'Numeralamp' is a fairly typical seven segment display with a standard nine pin base. The unusual feature which sets this device apart from other similar tubes is that it has a small stand-alone incandescent lamp as its decimal point indicator, technically making it a multi-envelope device. The Numeralamp also appears to have a second attachment point for another incandescent lamp at the top of the tube. The filaments on this display are rated at 4 volts, and Lamps Inc claims a very high lifespan of 200,000 hours for the tube filaments if that voltage is maintained. Special thanks to reader Guido Mennen for identifying this previously anonymous device.